Chernobyl Nuclear Power Plant reactor number 4, the enclosing sarcophagus and the memorial monument, 2009. Eight German nuclear power reactors (Biblis A and B, Brunsbuettel, Isar 1, Kruemmel, Neckarwestheim 1, Philippsburg 1 and Unterweser) were permanently shutdown on 6 August 2011, following the Japanese Fukushima nuclear disaster. Nuclear energy policy is a national and international policy concerning some or all aspects of nuclear energy, such as mining for nuclear fuel, extraction and processing of nuclear fuel from the ore, electricity generation by nuclear power, enriching and storing spent nuclear fuel and nuclear fuel reprocessing. Since nuclear energy and nuclear weapons technologies are closely related, military aspirations can act as a factor in energy policy decisions. The fear of nuclear proliferation influences some international nuclear energy policies. The use of nuclear energy is limited to a relatively small number of countries in the world. As of 2007, only 31 countries, or 16% of the 191 United Nations Member States, operated nuclear power plants. Countries that rely most on nuclear energy were France (with 75% of its electricity generated by nuclear power stations), Lithuania, Belgium, Bulgaria, Slovakia and Sweden, Ukraine and South Korea. The largest producer of nuclear capacity was the USA with 28% of worldwide capacity, followed by France (18%) and Japan (12%). In 2000, there were 438 commercial nuclear generating units throughout the world, with a total capacity of about 351 gigawatts. Following the March 2011 Fukushima nuclear disaster, Germany has permanently shut down eight of its 17 reactors.]] Italy voted to keep their country non-nuclear. Switzerland and Spain have banned the construction of new reactors. As of 2013, countries such as Australia, Austria, Denmark, Greece, Ireland, Italy, Latvia, Lichtenstein, Luxembourg, Malta, Portugal, Israel, Malaysia, New Zealand, and Norway remain opposed to nuclear power. Germany and Switzerland are phasing-out nuclear power. Globally, more nuclear power reactors have closed than opened in recent years. After the 2011 accident at the Fukushima Daiichi Nuclear Power Plant, China, Germany, Switzerland, Israel, Malaysia, Thailand, United Kingdom, and the Philippines are reviewing their nuclear power programs. Indonesia and Vietnam still plan to build nuclear power plants. Countries such as Australia, Austria, Denmark, Greece, Ireland, Luxembourg, Portugal, Israel, Malaysia, New Zealand, North Korea, and Norway remain opposed to nuclear power. Australia produces no nuclear power. Plans to review whether the country should develop nuclear power were abandoned after Kevin Rudd, who opposed the move, was elected prime minister in 2007. As of 2006, Finland's nuclear power program has four nuclear reactors. The first of these came into operation in 1977. They now provide 27% of Finland's electricity. The third Olkiluoto reactor will be the new European Pressurized Reactor. Scheduled to go on line in 2011, it will have a power output of 1600 MWe. Construction of Olkiluoto 3 started in August 2005. Two and a half years later the project is "over two years behind schedule and at least 50% over budget, the loss for the provider being estimated at €1.5 billion". Demonstration against nuclear tests in Lyon, France. After the oil crisis of the early 1970s, the French government decided in 1974 to move towards self-sufficiency in electricity production, primarily through the construction of nuclear power stations. France today produces around 78.1% of its electricity through nuclear power. Because France produces an overall electricity surplus, it exports nuclear-produced energy. Some of this goes to countries which are ostensibly against the use of nuclear energy, such as Germany. The Board of Electricité de France (Électricité de France or EDF) has approved construction of a 1630 MWe European Pressurized Reactor or EPR at Flamanville, Normandy. Construction is expected to begin in late 2007, with completion in 2012. In the 1970s, an anti-nuclear movement in France, consisting of citizens' groups and political action committees, emerged. There were many large anti-nuclear protests and demonstrations. More recently, targeted campaigns have been conducted, mainly by Greenpeace, and Sortir du nucléaire (France) has called for an official safety inspection of the Areva facilities. Anti-nuclear protest near nuclear waste disposal centre at Gorleben in northern Germany, 2008. 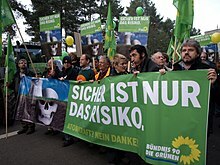 In 2000, the German government, consisting of a coalition including the Green party Alliance '90/The Greens officially announced its intention to phase out nuclear power in Germany. Jürgen Trittin, the Minister of Environment, Nature Conservation and Nuclear Safety, reached an agreement with energy companies on the gradual shut down of the country's nineteen nuclear power plants and a cessation of civil usage of nuclear power by 2020. Legislation was enacted in the Nuclear Exit Law. The power plants in Stade and Obrigheim were turned off on November 14, 2003, and May 11, 2005, respectively. Dismantling of the plants is scheduled to begin in 2007. But the Nuclear Exit Law did not ban enrichment stations - one in Gronau has received permission to extend operations. There have been concerns over the safety of the phase-out, particularly in terms of the transport of nuclear waste. In 2005 Angela Merkel won the German federal election in 2005 with the CDU party. She has subsequently announced to re-negotiate with energy companies the time limit for a shut down of nuclear power stations. But as part of her pact with the SPD, with whom the CDU form a coalition, the phase-out policy has for now been retained. In November 2008, a shipment of radioactive waste from German nuclear plants arrived at a storage site near Gorleben after being delayed by large protests from nuclear activists. More than 15,000 people took part in the protests which involved blocking trucks with sit-down demonstrations and blocking the route with tractors. The demonstrations were partly a response to conservative calls for a rethink of the planned phaseout of nuclear power stations. Japan has 55 reactors of total capacity 47,577 MWe (49,580 MWe gross) on line, with 2 reactors (2,285 MWe) under construction and 12 reactors (16,045 MWe) planned. Nuclear energy accounts for about 30% of Japan's total electricity production, from 47.5 GWe of capacity (net). There are plans to increase this to 37% in 2009 and 41% in 2014. On 16 July 2007 a severe earthquake hit the region where Tokyo Electric's Kashiwazaki-Kariwa Nuclear Power Plant is located. The plant with seven units is the largest single nuclear power station in the world. All of the reactors were shut down and are expected to remain closed for damage verification and repairs for at least one year. During the Fukushima nuclear disaster there was a failure of cooling systems at Fukushima Daiichi Nuclear Power Plant in Japan on March 11, 2011, and a nuclear emergency was declared. This was the first time a nuclear emergency had been declared in Japan, and 140,000 residents within 20 km of the plant were moved out. Explosions and a fire resulted in dangerous levels of radiation, resulting in a stock market collapse and panic-buying in supermarkets. Shippingport power plant was the first commercial nuclear power plant built in the United States in 1958. After the growth of nuclear power in the 1960s, the Atomic Energy Commission anticipated that more than 1,000 reactors would be operating in the United States by 2000. But by the end of the 1970s, it became clear that nuclear power would not grow nearly so dramatically, and more than 120 reactor orders were ultimately cancelled. As of 2007 in the United States, there are 104 (69 pressurized water reactors and 35 boiling water reactors) commercial nuclear generating units licensed to operate, producing a total of 97,400 megawatts (electric), which is approximately 20% of the nation's total electric energy consumption. The United States is the world's largest supplier of commercial nuclear power. The Three Mile Island accident has been the most serious accident experienced by the U.S. nuclear industry. Other accidents include those at the Davis-Besse Nuclear Power Plant, which has been the source of two of the top five most dangerous nuclear incidents in the United States since 1979, according to the Nuclear Regulatory Commission. Several US nuclear power plants closed well before their design lifetimes, including Rancho Seco in 1989 in California, San Onofre Unit 1 in 1992 in California (units 2 and 3 are still operating), Zion Nuclear Power Station in 1998 in Illinois and Trojan Nuclear Power Plant in 1992 in Oregon. Humboldt Bay Nuclear Power Plant in California closed in 1976, 13 years after geologists discovered it was built on a fault (the Little Salmon Fault). Shoreham Nuclear Power Plant never operated commercially as an authorized Emergency Evacuation Plan could not be agreed on due to the political climate after the Three Mile Island and Chernobyl accidents. Many plants have recently received 20-year extensions to their licensed lifetimes. ↑ The World Nuclear Industry Status Report 2007 p. 6. ↑ Annika Breidthardt (30 May 2011). "German government wants nuclear exit by 2022 at latest". Reuters. ↑ "Italy Nuclear Referendum Results". June 13, 2011. ↑ Henry Sokolski (November 28, 2011). "Nuclear Power Goes Rogue". Newsweek. ↑ "Nuclear power: When the steam clears". The Economist. March 24, 2011. ↑ 7.0 7.1 Duroyan Fertl (June 5, 2011). "Germany: Nuclear power to be phased out by 2022". Green Left. ↑ 8.0 8.1 "Difference Engine: The nuke that might have been". The Economist. Nov 11, 2013. ↑ James Kanter (May 25, 2011). "Switzerland Decides on Nuclear Phase-Out". New York Times. ↑ "Olkiluoto pipe welding 'deficient', says regulator". World Nuclear News. 16 October 2009. Retrieved 8 June 2010. ↑ "Olkiluoto 3 delayed beyond 2014". World Nuclear News. 17 July 2012. Retrieved 24 July 2012. ↑ "Finland's Olkiluoto 3 nuclear plant delayed again". BBC. 16 July 2012. Retrieved 10 August 2012. ↑ Jo Chandler (March 19, 2011). "Is this the end of the nuclear revival?". The Sydney Morning Herald. ↑ Aubrey Belford (March 17, 2011). "Indonesia to Continue Plans for Nuclear Power". New York Times. ↑ The World Nuclear Industry Status Report 2007 p. 26. ↑ "Nuclear Power in France. Briefing Paper 28". Uranium Information Centre. June 2007. Retrieved 2007-07-13. ↑ "Significant nuclear-related news items in perspective". Uranium Information Centre weekly digest. 2006. ISSN 1326-4907. http://www.uic.com.au/wns0512.htm. Retrieved 2006-05-19. ↑ "German nuclear energy phase-out begins with first plant closure". Terra Daily. 2003-11-14. Retrieved 2007-07-13. ↑ Wolfgang Renneberg (2001-05-24). "Nuclear phase-out in Germany and the Challenges for Nuclear Regulation. Address". Federal Ministry for the Environment, Nature Conservation and Nuclear Safety. Retrieved 2007-07-13. ↑ "German Parties Set to Clash Over Nuclear Power". Deutsche Welle. 2005-10-30. Retrieved 2007-07-13. ↑ Geir Moulson (2005-11-14). "Top parties approve pact that will make Merkel Germany's first woman chancellor". CBC News. Retrieved 2007-07-13. ↑ The World Nuclear Industry Status Report 2007 p. 23. ↑ Nuclear Regulatory Commission (2004-09-16). "Davis-Besse preliminary accident sequence precursor analysis" (PDF). Retrieved 2006-06-14. and Nuclear Regulatory Commission (2004-09-20). "NRC issues preliminary risk analysis of the combined safety issues at Davis-Besse". Retrieved 2006-06-14. This page was last changed on 2 July 2018, at 14:22.